Disruptive Mood Dysregulation Disorder (DMDD) is a new entity coming to DSM5 in May 2013 that describes children with noncyclic but frequent and severe outbursts along with a chronically irritable mood. The diagnosis was built to capture many children who have previously been diagnosed with entities such as Bipolar Disorder. The disorder remains controversial and this new study sought to examine some of the characteristics of this new diagnosis. The data come from the multi-centered Longitudinal Assessment of Manic Symptoms Study that examined 706 children between the ages of 6 and 12. The sample was followed at baseline and again 12 and 24 months later using a number of instruments and assessments including the adaptation of items from a semi-structured interview that was used to retrofit the DSM5 criteria items of DMDD since it didn’t exist at the time the study was started. A total of 26% of their sample at intake met criteria for DMDD. Compared to those without DMDD, these children had higher rates of ADHD, oppositional defiant and conduct disorder and their symptoms of these disorders as well as overall impairment were more severe. The rate of Bipolar Disorder and ratio of males to females among other things, was not statistically different between the two groups. There were also no significant differences with regard to family history. Approximately 53% of the DMDD group at intake also met criteria at 12 month follow up while only 19% of the sample were positive at all three assessments. An intake DMDD diagnosis was not related to the onset at follow-up of Bipolar Disorder. 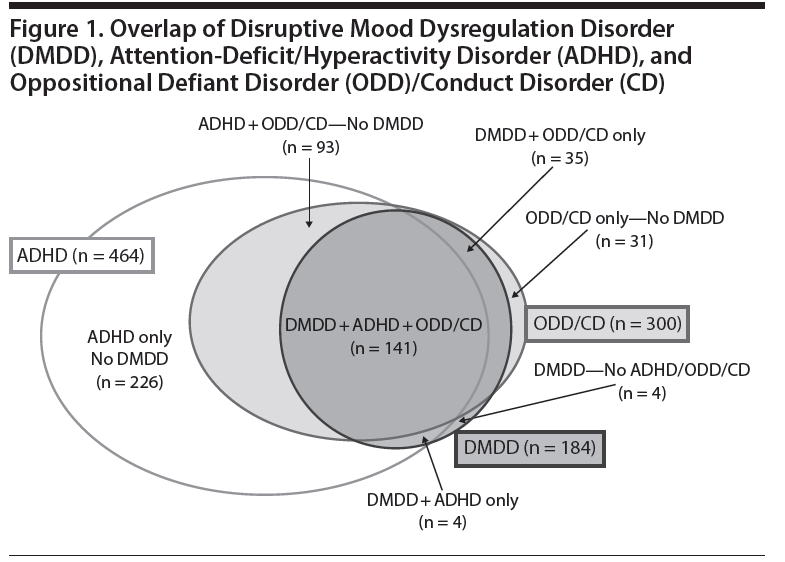 The authors conclude that DMDD is a common condition but one that is somewhat transient and difficult to distinguish from oppositional and conduct disorder. Overall, they raise some concern about the validity of this new entity. One irony to this study is that the criticism of this new DMDD diagnosis resembles that leveled against more broadly defined Bipolar Disorder – the condition this new diagnosis was designed to fix and where studies show that nearly all children meet criteria for something else as well. If we are to reject DMDD because subjects meet criteria for something else and many children over time don’t retain their diagnosis (especially as assessed in a naturalistic study) then many other diagnoses are in jeopardy as well. There is also some concern of a selection bias for this study as subjects needed to have elevated scores on a questionnaire designed to assess mania to be included. Axelson et al., Examining the proposed diagnosis of disruptive mood dysregulation disorder in children in the longitudinal assessment of manic symptoms in children study. J Clin Psychiatry 2012;73:1342-1350. This entry was posted on Thursday, December 6th, 2012 at 6:23 pm and is filed under Bipolar Disorder, Diagnosis. You can follow any responses to this entry through the RSS 2.0 feed. Responses are currently closed, but you can trackback from your own site.